So this is what’s called an “Icon” at least that is how my learned artistic colleagues at the Eagle Gallery refer to it as. I just hope it doesn’t offend too many people. It grew out of a desire to use some gold paint I had, rather than any great political or satirical ambitions. Originally, I had wanted to do this subject on a small bit of driftwood or the like in a precious little frame. Goodness knows how I would of achieved any form of likeness or detail at a smaller scale. The idea altered when I found a very decorative gold frame in a charity shop. Now I needed a canvas, amazingly, the one and only remaining canvas in “The Works” Luton was the correct size, I realised destiny beckoned and the project was under way. Quite an early idea was to feature the faces of David Cameron and George Osbourne as the mother and child. It was their cherubic features that drew me to this idea rather than a desire to insult them in any way! Indeed I don’t think this image particularly reflects the relationship between the two. Perhaps Nick Clegg as the infant would work better as political satire. I remember Spitting Image used a large puppet of David Owen and a small one of David Steele. I certainly didn’t want to copy this, and the suggestion of one character dominating the other was not the theme I wanted after all. I do quite like the parental angst shown here - with a boisterous child being looked after by a weary mother. I imagine a cabinet minister could push the patience of a prime minister, but I don’t believe this is considered the case with these two. This painting also questions the relationship between the Virgin Mary and the baby Jesus. Hey why offend one set of people if you can offend another set too! So far no one has recognised the figures as Cameron and Osbourne – a little sad really as it suggests the piece is just not very good. On the other hand these types of paintings seem to have meanings hidden in the placement and use of birds/ plants/ hands whatever. So if people see faces that they don’t quite recognise but assume mean something important then that’s all right with me. In the beginning (well some months previous to the nebulous of this idea), I had bought the book “Gothic Painting” by Cyril G.E. Bunt from the Eagle Bookshop for a pound. I did this hoping to stimulate some ideas for compositions. I ultimately used the black and white plate “The Madonna of the Rose Bower” by Martin Schongauer as the main reference material. I only researched this image in full colour on the net later after I had concocted my own colour scheme. Using a blue sky like background and a blue robe were the main differences to the yellow background and the red robe of the original. There was not enough detail in the birds and flowers, so I sourced other images for these. I even added a Pukeko in the bottom right corner – a bird indigenous to New Zealand. What does this mean? Well the wife is from New Zealand and that’s a good enough reason for me. 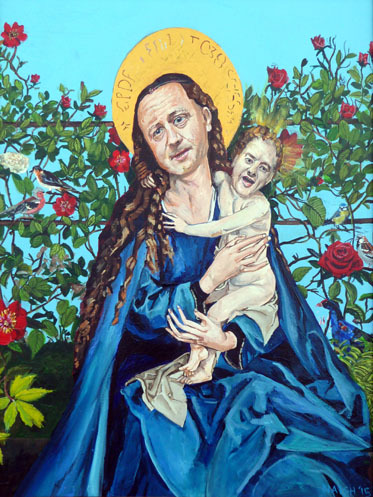 As for a title I was going to use “The Virgin Dave” but felt as explained above that I was not really being satirical and so I resorted to something more neutral: “Mother and Child” .